by Hubert Keil. The dream of living in Spain with it´s sun, ocean breezes, white sandy beaches and rich food makes it an inviting place to call home. However... the thought of moving to Spain brings up many questions. How can you get into the Health Care System in Spain and how good is it? You have heard stories about houses being illegally built, How do you know when you are Buying Property that it is legal? Where can you find stable work ? Do you need work permits? Should you register with the Tax authorities and how do you? When are you responsible for Income Taxes? 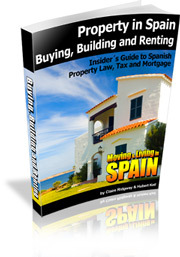 What permits do you need to live in Spain? Where can you get them? Can you get by speaking only English? Do you need to learn Spanish to live and work there? Does Spain have a good school system? Are there English speaking schools? When my wife and I moved to Spain, we faced the same exact questions. Needless to say we learned a lot... the hard way. Fortunately my wife speaks the language, which definitely was a great help. We hear it all the time very often the excitement of moving overshadows the details. A couple sees an ad boasting of the Costa Blanca's great climate, inexpensive cost of living, and a simpler life. They do some research, talk about it, and make the move. Then... reality hits them. They where not prepared and must pay for an expense move back. But... the story could be much different with some help and our first hand experience. Our family moved to Spain and we absolutely love it . It has been heartbreaking for us to watch so many people fail and families suffer, because of the lack of preparation in their move to Spain. We created additional hands-on checklists and guides. 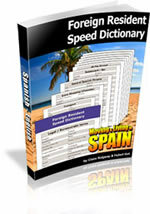 These ebooks are sold individually from $7 to $17 each and are jammed packed with practical information you need when moving to Spain. The Foreign Resident Speed Dictionary will help you find some of the most useful and common words and phrases for foreign residents. The reason we can offer it at this low cost is because the ebook is downloaded to you over your computer and we don't have to fork out any shipping, storage, or manufacturing costs. So we pass the savings on to you. Our 100% "Better-Than-Risk-Free" Money Back Guarantee! We say "Better-Than-Risk-Free" since all of the 3 bonuses are yours to keep even in the unlikely event you return the ebook... What we are saying is... Try It Out! We personally guarantee; if you don't learn something new and it will help you in your move to Spain - We'll refund your purchase . No questions asked. A totally Risk Free Decision. All ebooks and guides are in PDF format and can be downloaded and printed out on your computer as soon as you complete checkout. No need to wait on the mail to arrive. Anytime, day or night, even at 2 a.m. in the morning, you will have it at your fingertips. Wishing you a wonderful new life in Spain. P.S. I'm only doing this as part of a special marketing test, so if you want to claim this moving and living in Spain ebook for just $34 PLUS get all THREE Super Bonuses valued at $34 but yours FREE, then I highly recommend that you click here now to claim your copy today!
" so easy to use... "
Its a joy to receive your guide ebooks, you have all worked so hard in providing the most informative information on your site, and its with this useful information that people enjoy and look forward to receiving. It is so easy to use and i would like to thank you all for the really good information. Keep up the good work. Just before we purchased an apartment in Spain we found the website and joined up. The e books and tips have been extremely helpful.
" ...such valuable information "
We are moving to Spain in four weeks time, the website & guide books have provided such valuable information.
" ...smashing service to us ex-pats "
I have been reading your newsletter and ebooks since they began, not only have you answered questions for me and my friends, but as I sell property here, you have been the fount of knowledge for my clients as well. Your e'books have made me more able to find the right areas for my people, all together a smashing service to us 'ex-pats'. Keep it up, and thanks a lot.
" ...bonus is that we can download the guide ebooks "
You have given much needed information about the area in which we have purchased a home, with places to visit near and far, that we feel it is home from home when we come over. The added bonus is that we can download the guide ebooks.